Renowned among Nepalese (Nepali) because of its historic background and beautiful shape; recommended for those who like to travel light..
“SiruPate” is a vocabulary in Nepalese word, the name is derived from a leaf’s name found in the hill areas of Nepal. “Siru” is the plant’s name and leaf of it is called “Paat”. Since the shape of the Siru’s leaf inspires the shape of the SiruPate kukri, the name is given so. And "Nepali" because it is very famous and common amongst all Nepalese. When it comes to kukri the first word a Nepalese would utter is "SiruPate". In the rural villages of hillside of Nepal local farmers carry out their daily domestic and livelihood work always carrying a kukri knife. Therefore a need for a handy, functional and mobile knife becomes necessary that would assist them to accomplish an objective that involves cutting etc. Since a SiruPate is slender, lighter and handier (making it more practical than other kukris) farmers prefer it and highly rely on it. The kukri knife not only helps a farmer do his daily profession but also safe guards him from imminent threats and danger from wild animals while in woods. This special bond between the user and his kukri keeps him stable, strong and always at bay. His kukri becomes like an guarding angel physically, mentally and religiously. SiruPate Nepali kukri is a simple. slim and light traditional version yet very effective and attractive at the same time. The mobility and well balanced weight of the knife make it more special and extra than its counterparts. It is designed for daily household usage and for outdoor as well. It is one of the most famous kukris in Nepal and always in high demand in local market. 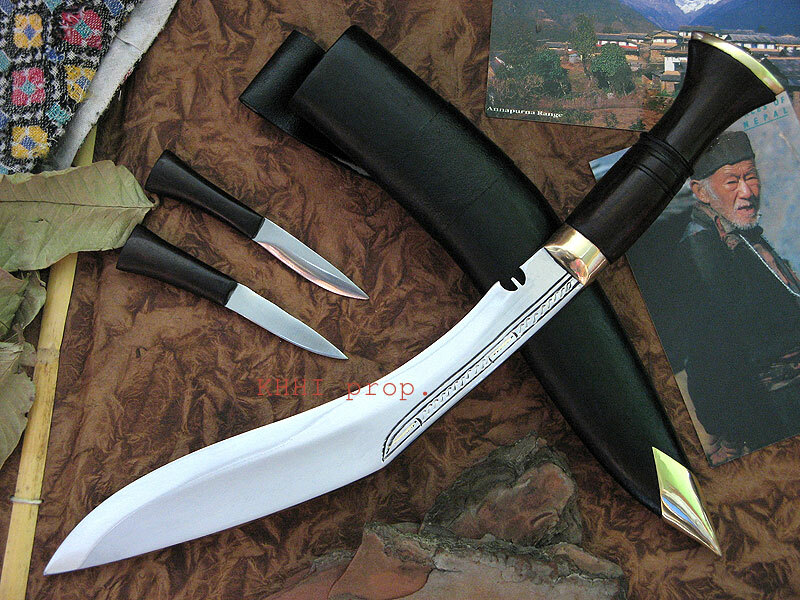 It is highly recommended for those who like to travel light and prefer light weight kukri. It also makes great gift to take back home from Nepal as the souvenir of the country. SiruPate is also an occasional kukri knife that is used in marriage ceremony and other religious events. It also accompanies a male dancer to perform the traditional “Kukri Dance” in Nepal. SiruPate kukri comes in a basic rat-tail tang handle with wooden grip secured with brass fittings. Received my Sirupate Slender today, and it is a very nice kukri. Was very surprised and pleased with the fast turn around. Also pleased after taking measurements that, the blade measured a full 10.25 inch long blade, but only weighed 493 g. Very pleased with the product, and I will for sure be ordering a different model soon.